Mastering the skill and art of Pay-Per-Click Management is not easy, and it’s essential to have a clear understanding of the Quality Score. Digital marketing companies have a major influence on the effectiveness and the cost associated with every paid search campaign. Consider the Quality Score similar to a credit score that can affect the decision whether or not a particular individual qualifies for a loan depending on the interest rate. It’s safe to say that Google’s Quality Score affects the performance of a PPC ad depending on how much a customer is paying for it but it does not include the web design cost. Apart from Google experts and programmers, nobody can say for sure how each of the above factors is weighed to get a high-ranking Quality Score in AdWords. Companies and digital marketing experts find it hard to decrypt the Quality Score Algorithm. The only factor that elaborates how the ranking system works is the click-through rate. CTR is the only component that can determine how many people have clicked the ad depending on its SEO and relevancy. Therefore, if a landing page on your website has higher ad ranking based on the number of clicks it gets, the lesser the cost of advertising on Google. 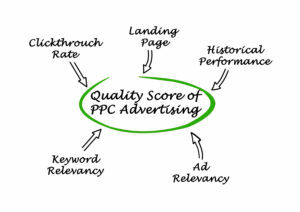 Quality Score is a tool for AdWords that measures the relevancy of the ads. Contact Digital Marketing and SEO experts at Forward Marketing by calling us at (773) 227-3269 or email us at info@fwd-mktg.com.